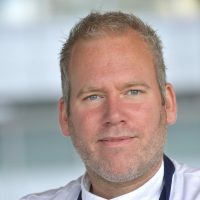 Circl restaurant is the stand out circular restaurant of Amsterdam under leadership of Chef Rudolf Brand since the opening in September 2017. Known for its market-driven dishes, quality ingredients, and sustainable wines, Circl has been widely lauded since opening and has been credited with helping to usher in a new, straightforward attitude in zero-waste cooking. In the kitchen Chef Brand experiments with sustainable cooking techniques such as fermenting and pickling. The goal is to serve delicious dishes with minimal energy consumption and waste production, and to make a positive impact. Rudolf started his career in London with an internship and stayed there for three years. Back in Amsterdam he started at Le Meridien Apollo Hotel as sous-chef. He later made the switch to Vossius and Restaurant Vermeer under the leadership of Chef Chris Naylor. In 2015, in collaboration with Restaurant Vermeer, he turned the flexitarian pop-up restaurant Roomservice at Olof's and in 2016 he continued that concept in Swych. The years working with Chef Naylor, where sustainability became commonplace, became the starting ground of Brand’s ambition to work only with seasonal and local products with more focus on vegetables.